The paperback has now been produced (this is the first 'proof' copy), which is just as well as a lot of people have been asking me for it. It will be on Amazon shortly, and I plan to do an official 'book launch' in my home town of Camberley (UK) at bookstore Waterstones prior to Xmas. Last weekend I was at the Writers Workshop Festival in York where some 400 writers, agents and publishers gathered. 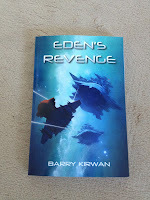 On Saturday evening I showed the front cover of Eden's Revenge on my I-Phone (kindle app) to a lady sitting next to me. She then proceeded to start reading and wouldn't give the phone back, and would not say anything. Ten minutes and a glass of red wine later she handed it back to me and said "Wow!" No birds ever approached the Fortress of Alessia. This was the first thing Esma noticed when she arrived after her long trek into the barren Tibetan foothills. The second was the architectural precision of the gothic castle, its steep black ramparts, towers and twisting spires rising skywards, as if uprooted from the earth by the stars themselves. Its cruel beauty went beyond anything she’d ever seen. Although it was over four hundred years old, Alessia’s Fortress looked as if it had been built yesterday. Archers’ slits in its three tall towers stared out over the surrounding land, unblinking eyes daring anyone below to step onto the path to its iron gates. The guide had left a mile earlier, unwilling to proceed further, and in the end had begged her to return with him to the safety of his village. But Esma turned her back on him, as she did on the rest of humanity, and continued alone. A savage wind scoured her sheepskin coat, leather face-mask and gloves as she walked with a measured gait under anvil-shaped clouds threatening winter’s first snowfall. Atop the towers, red and gold pennants displaying bloodied eagle’s claws whipped and crackled, the emblazoned talons seeming to grasp at the air. Prayer wheels, adapted from naïve Buddhist ideology to worship another entity, one altogether more sublime and not of this world, whistled like banshees across the bleak countryside. Esma had left her family for good this time, after one beating too many, and had not told her bitter mother or sickly brother where she was going. They would not understand, and she no longer cared. For two years Esma had secretly followed the Order of Alessia as an acolyte-in-waiting, after being noticed by a wandering monk visiting her home city, Padua. He made a speech in the central plaza, addressing anyone who would listen, and asked what they all saw when they raised their eyes to the night sky. Most in the lingering crowd talked of God and his marvels. Esma waited till the throng dispersed and approached him on her own; she had often looked up, craving an alternative to the misery she and others endured. On her way to the mountains, she passed through a village where the very same wandering monk who had first inspired her three years earlier had been arrested for heresy. As an outsider sheltering against the winter at a local inn, she was questioned by men in scarlet cloaks, witchfinders. Seeing his battered, tortured body chained in the market place, scorched eye sockets in his listless head, and beholding the faces and shrieking accusations of the local villagers filled with rage and bloodlust, fear seized Esma. When dragged before the monk, she vehemently denied knowing him, adding her voice to those crying out for him to be burned at the stake. Once released, she fled the village. Huddled in her coat on the hillside that evening, she watched the smoke rise from the pyre, occasionally catching the shrill screams of the monk’s voice that had so entranced her in Padua, and the jeering of the crowd. Afterwards, Esma wandered for five days and nights, not eating, punishing herself for being so weak, vowing it would never happen again. On the months-long journey, she studied hard, always dwelling on the words of Alessia, promising a better life than Esma had known. Now she would finally meet the High Priestess herself, or at least glimpse her. As she strode against the wind, up the winding cobbled pathway and endless granite steps, she spied something from the corner of her eye – a blue-black beast, its carapace shining like that of a beetle. It had a strangely shaped head, not quite a rectangle, more like the silhouette of a half-open book. But this creature was the height of two men, and moved so fast it was gone almost before her mind could paint its picture. Esma had heard the rumours. So, it was true, they were here. She quickened her pace. Life in the fortress was hard, its rules strict and unforgiving, but Esma endured it, doing whatever was asked no matter how menial, without question or complaint. Tilgar was stern with her in front of others, gentler when it was just the two of them, as he instructed her in the Order’s ways and in her chosen specialism, the study of written scripture. With his quiet but sharp mind and constant attention to detail, and his patience with her, he became the father figure she had never known. When she had a spare moment she would approach the narrow windows where the wind howled, and stare out, hoping to catch sight of the beast, but to no avail. Esma told no one what she had seen; in the Order, it was dangerous to know more than one should. She did however catch rare glimpses of Alessia, easily recognised by her mane of flowing red locks as she swept across the inner courtyard from the base of one stone tower to another. Alessia at first said nothing, the hint of a smile playing across her lips. Her jade eyes fixed on Esma, the smile evaporating. “Once is a mistake, twice is a fault.” Alessia turned and continued in her whirlwind fashion towards the principal tower where the Order’s Council met regularly. Esma watched Alessia go, feeling as if she had just been touched by an Angel of God. Esma had never been interested in boys, or in the sinful pleasures of the flesh, but she was still young, and that night she found herself unable to sleep, and with a gnawing sense of disgust, she exorcised the bad thoughts in the only way she knew. But it was different this time. Instead of trying to conjure up enthusiasm in her mind’s eye for the handsome young groom other girls fantasized about, Esma imagined Alessia’s beatific face, her slim but strong hands caressing her. In her ecstasy Esma cried out in the female dormitory. But in the morning her shame at this profane, animalistic activity bubbled to the surface like acid on skin. She had been disrespectful to Alessia, and Esma vowed never again to demean herself or another by proxy. She threw all her energy into her work. Months passed, and Esma progressed in her duties – she could write well, and Tilgar had been teaching her a challenging new script, one with serifs, barbs and jagged points, an aggressive rune alphabet that looked sharp enough to draw blood. But she didn’t just copy, and learning more, Esma began to translate, occasionally finding herself staring at these words and their unfolding concepts like none she had ever heard, even inside the Order. Her ability to fathom meaning behind the alien language didn’t go unnoticed by Tilgar. Esma did not know if this was good or bad news. 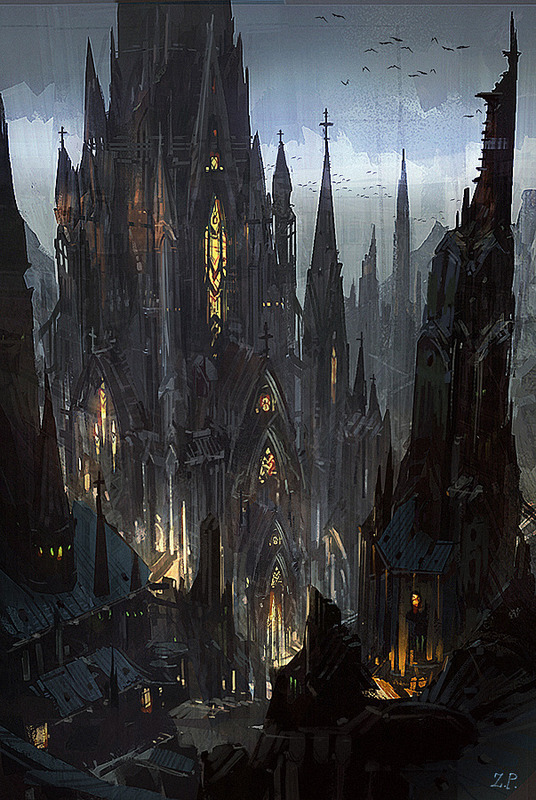 One night Tilgar woke her quietly – she had been summoned to a room at the top of the second tower, where the elite lived. Once there, Tilgar ushered her inside and then left, closing the heavy oak door behind him. A flaxen-haired knight in chain-mail armour sat upright in a high-backed wooden chair. Silburn: she had seen him occasionally in the fortress, often with Alessia. He was second-in-command. Silburn rose. “Come,” he said, walking out to the balcony where flurries of snowflakes swirled, in no rush to reach the ground. She stood a little behind him but he gestured for her to stand at the edge, a knee-high stone wall separating them from a sheer drop into darkness. Silburn’s hand went to the small of Esma’s back. She stiffened. One small shove and she would depart this world. The hand remained firm, a judge deciding her fate. “Continue.” Silburn’s voice was as unfeeling as the stone wall at her sandaled feet. Esma tried not to shiver. “Somewhere out there is another life, another way, more than us.” She paused, then decided to say it. “I saw one. When I first arrived. Barely a glimpse. But what I saw… impressed me. Such grace and power.” She waited, then continued. 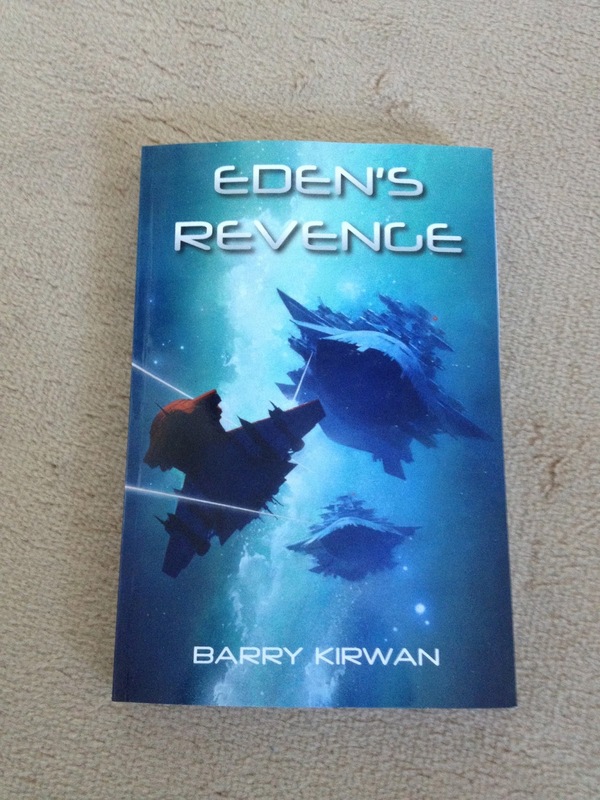 “I know they are not gods, yet it seems to me – from what I have read – that they are closer to God than we.” She dared to glance across to see Silburn’s reaction, but his face was as unmoving as the granite walls. Her own face turned downwards, to the oblivion below. “No,” she said, a shiver breaking through despite her best efforts. She had hinted several times, asked Tilgar questions that might have given away what she had seen, but Esma didn’t want to get her master into trouble; he had been kind to her. She shook her head. Esma knew that words held deadly power in the Order, especially secrets. Sometimes acolytes disappeared, and no one asked questions afterwards. The line between savant and heretic was of a hair’s breadth. The words echoed in her head, like the eddies of snow before her, making her feel giddy. “Yes,” she said, swallowing, guessing she had over-stepped the mark. For the first time in months she visualised her mother, sneering, saying that Esma had always had too much to say, had never accepted her place, and would now pay the price. She would end her life gashed open on the rocks below, leaving carrion birds and insects to pick her bones dry. Esma thought of her sickly brother, Arnault, surely by now taken by the plague ravaging the land. At least he would be sad for her fate. So be it, she and her sibling would comfort each other in whatever came after. Silburn’s face turned to her. “Then will you die for the Order, Esma?” He removed his hand from the small of her back. Esma found her hands shaking, her lips quivering. She stared into Silburn’s eyes, but they were pitiless, they had probably seen and dispatched such death that there was no mercy remaining in his soul. Bracing herself, she squeezed her lips together, clenched her fists against the biting pain of cold in her fingers. She lifted one foot on top of the low wall, then pushed up and stood atop the slippery, uneven stone. Her mind, awash with fears and inner cries, suddenly cleared, as if she had broken through its surface ice to clear water underneath. The shaking stopped, and she felt at peace. She wanted to say some last words, and then it came to her, the only two things she cared about. “I do this for Alessia, and for the truth that cannot yet be known or spoken.” Eyes wide open, she sucked in a deep breath, leaned forward and took a step. Meeting his eyes, she stepped back down cautiously, the shaking returning with a vengeance, her breathing ragged. A single tear escaped. She brushed it away as if it was snow, and in her mind’s eye her mother was silent for once, while her brother beamed. To her surprise, Tilgar joined them on the balcony, wearing a look somewhere between shocked admiration and pride as he wrapped a blanket around her trembling frame. Esma found she needed Tilgar’s arm to steady herself as she walked to the door. 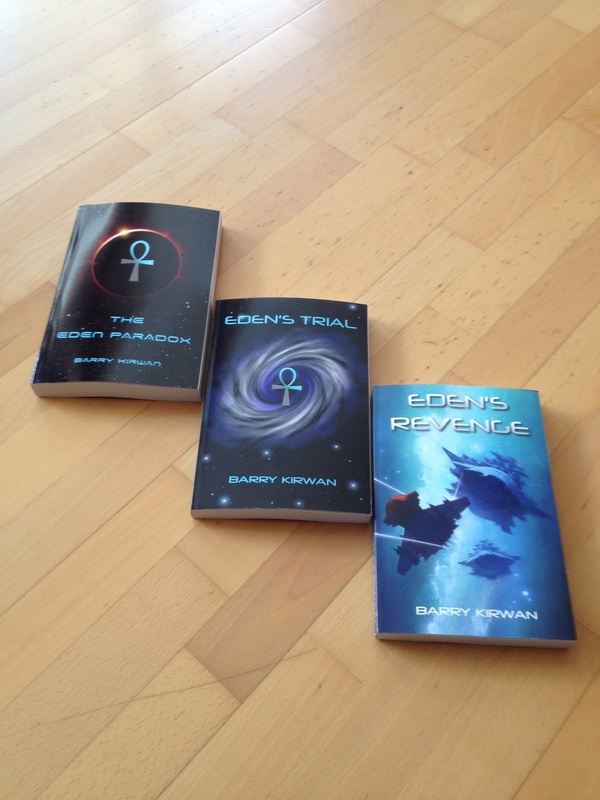 "Best science fiction of the year"
"Amazing ideas I've not heard of in 55 years of reading Scifi"